It's the beginning of winter in 2020, and it will be the worst winter since the last ice age. Dylan MacRae leaves the small cinema where he grew up with his mother and grandmother to live in a caravan park in Clachan Fells, Scotland. Living in a neighboring caravan are Constance, a woman perpetually caught between two lovers with no desire to settle down, and her trans teen daughter, Stella. Each of these characters is alone or isolated in some way when the story begins, but as temperatures plummet they come to depend on each other and grow closer as the winter settles around them. Constance is single at the beginning, which is good news to Dylan who is smitten with her pretty instantly, but everyone else knows it's only a matter of time before she gets back with Alistair and/or Caleb. Dylan has recently lost the only family he's had, his mother leaving him the caravan to which he moves when he loses the theater for financial reasons. He brings two tubs of ashes and his gin still, which is all he needs to start over again. Stella has been living as a girl for about a year, and feels like her only friend is Vito, an Italian who she met online, until she meets Dylan. Stella is on the cusp of adolescence, and is desperate to get started on hormone blockers, but their location in rural Scotland and the impending winter are making anything short of survival a low priority. All of these people are sympathetic but imperfect, as the best characters are. Of course I felt so much for Stella, alienated from her peers, her own father refusing to call her by her new name. She's a tough kid though, just like her mother. I loved Constance, actually. One of her lovers, Stella's father Alistair was married three times in the course of his relationship with Constance, but it wasn't like she was sitting around waiting for him to come to her. This is just how she was, and she was completely unapologetic. When Stella began transitioning, it of course required lots of meetings with the school regarding use of bathrooms and locker rooms and whatnot. "At one of the meetings Mother Superior asked her mother why her father wasn't there. Constance said he was with his wife, and she could bring her other boyfriend in if it helped any." This isn't Constance being stupid; she owns her lifestyle and doesn't care what anyone - even the nuns - think about it. I suspect that is part of what makes Dylan love her. Poor Dylan. He's a good guy, just trying to do what's right and provide everyone with quality gin from his grandmother's recipe to take them through the long winter. As much as I liked these characters, I think my favorite part of this book is the language. 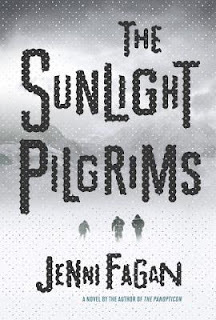 Fagan describes the snow and ice so beautifully throughout the story, that it was easy to forget how deadly it was. "Sun spirals down through treetops showing up sediments of silver and amber dust. A frozen pond. Curls of ice make a frost flower on a fallen bough. Each iced petal is perfectly curled and see-through. Winter has been hand-carving them overnight. Placing them here." I think I wanted a little more about the environmental catastrophe. The world is essentially freezing over and it's devastating, and nobody was sure if the winter would end or if they'd enter another ice age. You know I love a good apocalyptic novel, so I can't get enough of the destruction, but this novel was definitely more focused on the people. And that's fine - it's good at what it is.